ALL committees are currently looking for new members to get involved. If you’re interested, please contact your unit president, or call the Local: 315-446-0330. Reviews financial transactions of the Local to ensure they are in compliance with CSEA’s financial standards code and other established policies. Has the duty and responsibility to help the Local President formulate a budget and plan for expenditures. Responsibility to assist the Occupational Safety & Health Specialist inform our membership to identify and prevent safety hazards, work towards correcting these problems, ensure compliance with safety guidelines and standards. Work with the CSEA department of Education and Training, focusing on the education and training needs of members and the training and development activities of officers and stewards, as well as designing interesting and informative programs and workshops to increase participation in and enhance skills for those attending Local workshops and functions. Works with the Region Political Action Coordinator in preparing legislative and lobbying programs, conduct endorsement interviews, training and recruiting volunteers. Protect and enhance the rights and privileges of CSEA members who served in the American Armed Forces. 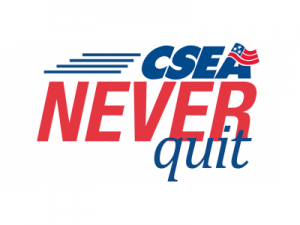 Helpful resources for veterans can be found on the CSEA Veterans Resources page. Concerned with decent, fair and equitable wages, dignity of work, decent work and work-related conditions, and development of the individual with special emphasis on the needs of women.